Imbibe has recently added a new feature to Mart; customized distance-based delivery charges. Stores can now add delivery charges according to the delivery distance for orders placed via Mart. In other words, store owners can specify delivery charges based on delivery distance (in miles/kilometres). Inclusion of delivery fee automatically: The sellers do not have to undergo the pain of adding delivery charges manually. Once they specify the distance and charges in their store settings, your e-commerce platform (Mart) will add the fee to every order automatically with respect to the delivery location and its distance from your store. Prevent losses in delivery: With auto-calculated delivery charges, it is easier for the sellers to prevent losses in delivery as now they can setup multiple slabs for delivery charges based on distance. Increased delivery area – Imbibe received feedback from multiple corners that stores were having to limit their delivery areas as they did not want to charge customers the same delivery fee over shorter and longer distances. The new feature enables you to specify larger delivery areas and specify delivery fee based on distance. What’s more, you can even choose to provide free delivery completely or provide free delivery only up to a specific distance. Enhanced customer base: Take your business to newer areas by not having to worry about the cost of delivery. After all, customers based on research are willing to pay for delivery charges from their favourite stores. How partners/sellers can configure this feature? Step 5: In the distance wise delivery charges section enter the Distances and Charges, one per row. 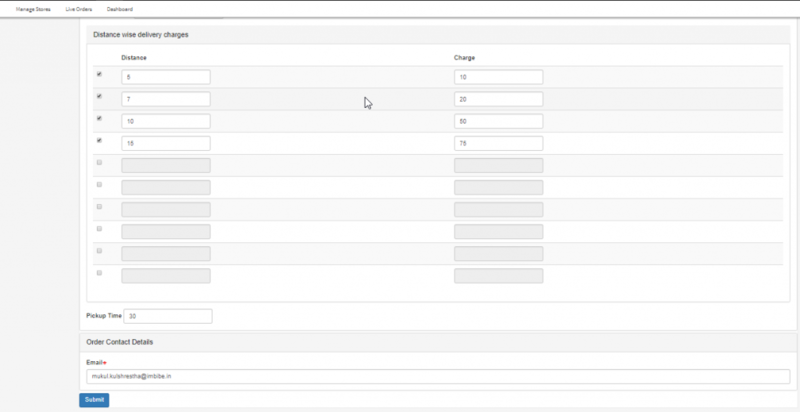 Ensure to select the checkbox in front of each row to enable that row. Step 6: Click on Submit button to save the changes. Partners can also enter fixed amount in delivery charge textbox for the delivery of orders exceeding the maximum distance specified in the distance wise delivery charges. At Imbibe, we strive to provide the best services for our clients and their customers. We keep introducing innovative features for our clients to enable them get the best out of our platforms. To know more about more about Mart and its features please get in touch with us here.